MOLESKINES - They're touted to be the notebook that legends like Picasso and Hemmingway used.I find the mini notebook very useful as i use it to jot down notes like new finds, contacts, and expense accounting. Yhe paper is first-rate as with the the quality of craftmanship. Available at FullyBooked, Bibliarch, Powerbooks and thru moleskineph.com. SNAP WATCH - I was never too comfortable with wristwatches as i found them constricting akin to shackling.G ood thing I found Snap Watch. They're made from real climbing rope and the rope snaps onto the waterproof lcd mechanism, hence the name. One caveat though: Snapwatch easily snaps free so just watch out if they catch on the handle of your bag or backpack. 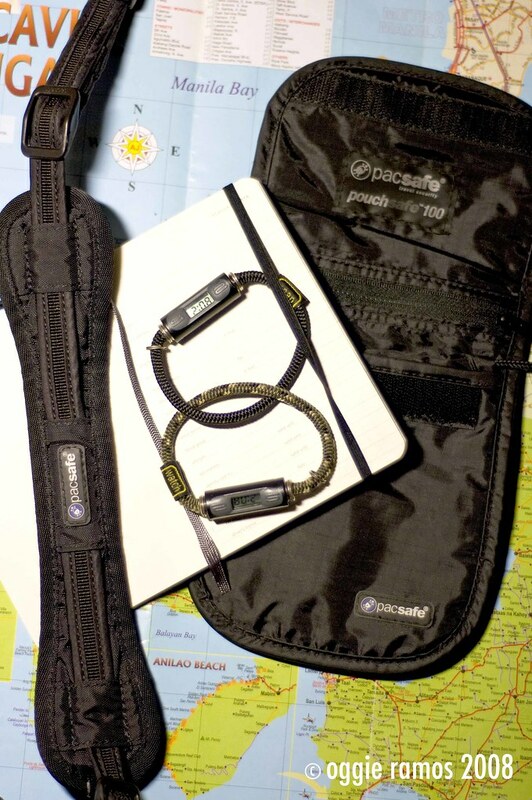 PACSAFE POUCHES & CAMERA STRAP - I've read about Pacsafe from way back and found it cool that they're available here at Bratpack at surprisingly very affordable prices. The main selling point of Pacsafe is the steel mesh hidden inside the rope or strap they use which makes them virtually slash-proof. I don't travel with my wallet and would rather use the Pacsafe Pouch so my money and valuable documents are always close to me. I also replaced my Kata camera strap with the Pacsafe camera strap since I find the slash-proof strap reassuring and it looks good to boot. My only complaint though is the narrow cushion used on the neck support; it tends to slip when one twists and turns but overall, it is great. might get a pacsafe camera strap too! wulferdz, totoo yan. nothing's like the original. i find it really useful sa biyahe and when referring back to things i might have missed. erick, it's definitely worth it. i'm very happy with my camera strap. tricky lang regarding availability but we just saw some sa robinson's galleria. hahaha, rayts, i order mine from a supplier based in hk, he's here at www.moleskineph.com. it's a bit less expensive kasi than the ones in powerbooks, bibiliarch, fully-booked, and bestseller. i love moleskines, iba talaga yung original. the snap watch is available at bratpack. medyo ubos lang nga yung stocks but we heard they're restocking in the new year.